I wrote earlier about the Triquetra Amulet: simply meaning “triangle” and has been used to referred to a variety of three-cornered shapes but has been evolved into a symbol of depth. 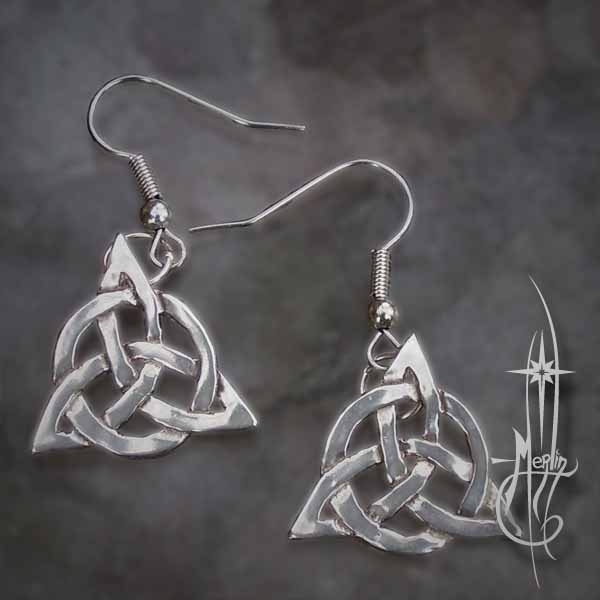 To accompany the Amulet, I have created a set of earrings of the same design: the Triquetra Earrings. Added to the Triquetra is a woven circle: The Unity of the Trinity, the Circle of Love unifies all. The Triquetra Earrings are for those who cherish the Trinity in any of its forms: The love of family, their religion, the earth itself, or simply find the shape of the triangle pleasing to their eye. but has been evolved into a symbol of depth. It has been a part of folk lore predating the creation of the ancient texts. a number of Manifestation in Creation. for they too love the manifestation of Three. the Triquetra is embossed on the Grimoire of the Three Sisters. the manifestation of Three and the integrity of one purpose through love. the idea of the Trinity in its many forms.